April 26, 2018: This graphic illustrates the scenario for the processes that create a Type IIb stripped-envelope supernova, in which most, but not all, of the hydrogen envelope is lost prior to the primary star’s explosion. 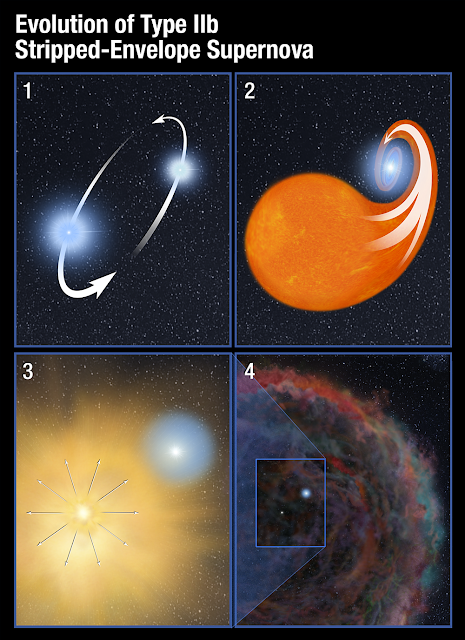 The four panels show the interaction between the SN 2001ig progenitor star, which ultimately exploded, and its surviving companion. 1) Two stars orbit each other and draw closer and closer together. 2) The more massive star evolves faster, swelling up to become a red giant. In this late phase of life, it spills most of its hydrogen envelope into the gravitational field of its companion. As the companion siphons off almost all of the doomed star’s hydrogen, it creates an instability in the primary star. 3) The primary star explodes in a supernova. 4) As the supernova’s glow fades, the surviving companion becomes visible to the Hubble Space Telescope. The faint remnant of the supernova, at lower left, continues to evolve but in this case is too faint to be detected by Hubble.